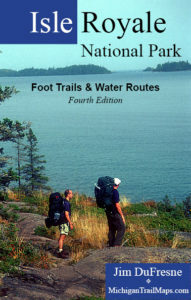 Isle Royale National Park: Foot Trails & Water Routes is Jim DuFresne’s classic to Michigan’s first national park. The guidebook to the wilderness areas of Isle Royale has been in publication in various editions for almost 30 years and today is known as the “backpacker’s bible” to the Lake Superior island. Isle Royale National Park: Foot Trails & Water Routes provides everything you need to know for an island adventure. The 184-page book contains chapters on the park’s flora, fauna, fishing opportunities and history as well as complete directions for trails and waterways, including mileage, difficulty and amenities at each destination. More than 60 photos and 35 detailed maps of the park’s backcountry round out the guidebook. "In a day when few travel guides are well written – and that is even more the case with outdoor guides – author Jim DuFresne gives us a book that is a joy to read. He understands the special love that binds hikers, fishers, and canoeists to the things of nature; dewy mornings, mischievous wildlife, lonely shorelines. And he describes those things endearingly. "- Chicago Tribune.